The Apprentice's Sir Alan Sugar has criticised the contestants in the last series and promised "better people" and "tougher tasks" in the show's new run. He said there had been greater focus on the calibre of contestants for the new series, to avoid the hit show becoming a "kind of Big Brother on wheels". He said he tried to tell if people were taking part "for the right reason", after seeing some exploit their fame. The Apprentice moves from BBC Two to One, starting on 28 March at 2100 BST. "There's a lot of regrets about last year - maybe turning up was the biggest regret about it," said Sir Alan with characteristic bluntness. "I was somewhat disappointed with the calibre of the contestants we had in the second series, to be frank with you," he said. "Part and parcel of me agreeing to do a third series was that the calibre needs to be looked at very carefully before we slide into a kind of 'Big Brother on wheels'." Last year's winner of a £100,000-a-year job with Sir Alan's Amstrad, Michelle Dewberry, left within months to start her own consultancy firm. She also had a high-profile relationship with fellow contestant Syed Ahmed, and was expecting his baby before suffering a miscarriage. 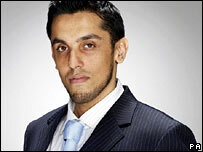 Other contestants have used The Apprentice as a springboard to media careers. "I always have the problem of wondering if they are here for the right reason and, as you have seen, some of them try to capitalise on the fact that they have been on the television. "It is something which I suppose I have to learn about in making sure the selection this time is people who are there for the right reason." While Sir Alan insisted that this year's contenders were "very high calibre", he admitted that the first task of selling coffee on London's streets saw them making "the same bloody mistakes" as their predecessors. "You would have thought they would have done their homework, and looked at every programme, seen certain things, known what not to do in certain tasks, and there again, the first task, what do they go and do? Buy too much stuff." The Apprentice has made an "unlikely but utterly watchable star" of Sir Alan, in the words of BBC One controller Peter Fincham. The former east London market trader's gruff appraisals of participants' shortcomings and mistakes, culminating in his catchphrase "You're fired" dismissal, are frequently the highlight of the show. And despite his doubts about The Apprentice's "class of 2006", the series finale achieved the show's largest ever audience of 5.7 million and prompted a move to BBC One. The first episode of the new series suggests a more light-hearted tone for the more mainstream channel, with early laughs generated by the candidates' David Brent-style management-speak. Lines like "Life isn't always biscuits and sandwiches", "We work until we bleed" and "Sell the experience" are in stark contrast to Sir Alan's brutally frank way with words. After watching the first episode and reflecting that the candidate dismissed at the end had been somewhat "stitched up" by colleagues, Sir Alan added simply: "That's life." The Apprentice's vital elements of slick sales patter, personality clashes, back-stabbing and passing the buck are in evidence from the off, and look set to provide the "water-cooler" discussion moments that have made the show unmissable for fans. Tough single mother Jadine Johnson, cocksure "wide boy" Tre Azam and calculating Simon Ambrose are among the personalities that promise to be worth watching for the length of their participation in the 12-week series. "We have got a great bunch here this time - obviously we need some characters for the television," said Sir Alan. Viewers should also see a softer side to the multi-millionaire, he said. "Especially in the second series, there was a desire to just show me banging my hands on the table, and being nasty and being horrible, and of course that's not really me. "I am not saying I can't be tough and demanding, but I think through the course of this series you might see a slightly more light-hearted version - but not too light-hearted." 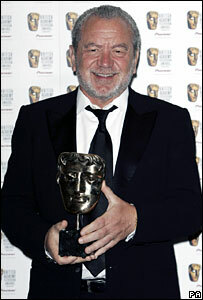 The first series of The Apprentice won a Bafta award, and Sir Alan believes it is reality television of substance, offering "some good business messages". "A lot of young people are inspired by The Apprentice," he said. Also praising programmes including Dragon's Den and Masterchef, Sir Alan said: "There is an air of quality to them, and there is a lack of this trash reality show stuff about them. "I think the BBC are absolutely miles ahead of anybody else at this." The Apprentice starts on BBC One on Wednesday 28 March at 2100 BST.